Phase II is now selling here at the new West Vancouver homes for sale at Headland Park real estate development. The distinctive West Vancouver homes of Headland Park reflect the integrity of classic organic elements such as wood, glass, metal and stone. Each Headland Park West Vancouver residence finds its essential structure and linear elegance in the natural world. Designed by world renowned Russell Hollingsworth, this interpretation of the West Coast style emerges in every aspect of the architectural experience of life at Headland Park West Vancouver homes for sale. With twenty five acres or prime North Shore real estate featuring only forty one custom built homes, these expansive homes are luxurious in every way, shape and form. A unique low density West Vancouver real estate development, each new Headland Park home is situated adjacent to a generous greenbelt, offering prime natural privacy as a counterpoint to the numerous amenities and recreational opportunities just minutes away from your front door. A circular North Shore real estate community of elegant and high-end West Vancouver Headland Park homes for sale are surrounded by a pond, park like setting, green spaces and lots of grass and professional landscaping. Within minutes of Vancouver, the balance between built environment, services and natural amenities is epitomized in the village of West Vancouver real estate community, a residential neighbourhood in a park like setting. Activities in and around the new Headland Park Homes of West Vancouver include year round golf courses, hiking at one of the beautiful local parks, skiing at Cypress Bowl Resort, walking or jogging the seawall and great dining and shopping options for homeowners. World class snow sports are also nearby at Whistler Blackcomb via the Sea to Sky Highway. The new West Vancouver homes at Headland Park are also close to Horseshoe Bay to get to Vancouver Island, Bowen, the Gulf Islands and the Sunshine Coast. The Headland Park West Vancouver homes are an experience of a lifetime. Located at 4985, 4987, 4989, 4995, 4997 and 4999 Meadfeild Wynd, West Vancouver real estate district. The new West Vancouver Headland Park homes are brought to the market by Re/Max and you can visit www.headlandpark.com for more information regarding floor plans, features, amenities and the location of this beautiful and quiet neighbourhood. Phase II launch is happening right now, so don’t wait until the opportunity of a lifetime is gone. Forever. More info coming soon. The distinctive luxury West Vancouver homes of Headland Park reflect the integrity of classic organic elements that include metal, glass, wood and stone. Each luxury home for sale finds its essential structure and linear elegance in the natural world surrounding the community. Russell Hollingsworth’s interpretation of the West Coast style merges in every aspect of the architectural experience of life in Headland Park West Vancouver real estate development. Located along the Caulfield Plateau, an exclusive residential area developed under the Caulfield Land Use Contract, the release of the last portion of this contract initiated the formation of the crowning jewel of the lands. This distinct Caulfield Plateau West Vancouver community is called Headland Park Homes. Created hand in hand with well known land developer Martin Corporation Limited, Headland Park West Van community is the last of the new neighbourhoods to be built below the Upper Levels Highway in West Vancouver real estate district. This unique low density development, each Headland Park luxury West Van home for sale is situated adjacent to a generous greenbelt, offering natural privacy as a counter point to the numerous amenities and recreational opportunities minutes away from your front door. Incredible new homes are now available amongst the old growth cedars and arbutus trees. With amazing panoramic views of the water, island and city skyline, the Headland Park West Vancouver homes for sale also features sunrises and sunsets that you have never experienced before. From Snaidero kitchens with high end stainless steel appliances, granite counter tops, as well as complimentary dining rooms, fireplaces, family rooms, sunken living rooms and masterful ensuite bathrooms, you will experience the best West Vancouver luxury homes to be built right now. Also featured are three bedroom plans, some with finished basements in addition to powder rooms for added convenience, limestone, carpet and hardwood flooring as well as artistic window treatments. Other notable features here at the last phase of the luxury West Vancouver Headland Park homes for sale include spacious patios, huge sliding doors into your back yards and carefully manicured green spaces, walking paths and waterfalls throughout the 26 acre estate. If you would like more information about this new West Vancouver real estate development or would like to make a sales enquiry, please contact RE/MAX Lionel Lorence at info@headlandpark.com. You can also visit their marketing website located online at headlandpark.com at any time for more information about Hollingsworth Homes Ltd, the participants as well as the luxury West Vancouver Headland Park homes for sale. The project is brought to you be Martin Corporation Limited and Hollingsworth Homes Ltd. The participants for this ultra luxurious Headland Park West Vancouver home community includes Hollingsworth Homes Ltd and Hollingsworth Architecture, Martin Corporation Limited (land developer), Chapman Land Surveying Ltd (surveyor), Read Jones Christoffersen Ltd. (structural engineer), Geopacific Consultants Ltd (geotechnical engineer) and RE/MAX (agent). Hollingsworth Homes, the builder for the luxury Headland Park West Vancouver homes for sale is a development team of dedicated professionals with an inherited link to the origins of West Coast Modern Architecture. Noted architects Fred Hollingsworth, Ned Pratt and Ron Thom were among the early creators of this distinctive style which has influenced the culture of the built environment both near and far. Their imagination and design works here at the new West Vancouver luxury homes for sale bring together architectural form, craft and the beauty of the site in a celebration of the art of living. Click here for the Evelyn West Vancouver marketing web site. A prestigious new enclave situated on West Vancouver’s natural rise. Evelyn Drive is a prestigious new enclave being developed by Millennium on West Vancouver’s natural rise. The Community has been designed by Canada’s Architectural master Arthur Erickson to capture the timeless appeal of West Coast modernism, and offers the quintessential West Vancouver lifestyle – characterized by light, forest, water and sky – enhanced by green design, urban conveniences and luxury. The diverse community that results from the mix of market and rental units, as well as the blending of family homes with condominiums, will enliven the Evelyn Drive neighbourhood. • Evelyn Drive comprises close to 21 acres and a total of 349 residential units, including 16 single family homes, 12 duplex dwellings, 57 cluster homes, 234 apartments/condominiums, and 30 rental apartments. • The apartments and condominiums will be LEED™ Silver Standards, and the cluster housing will meet a LEED™ Silver equivalent. • As part of the project’s focus on sustainable living, the development will incorporate the use of a geothermal energy system. • A stand-alone amenity building will contain outdoor lap pool, whirlpool, sauna and steam room, gym and lounge. • Several pedestrian walks will be created, including the wheelchair-accessible Evelyn Walk, a Village Walk that will lead down to Park Royal Mall, and numerous sidewalks and trails. 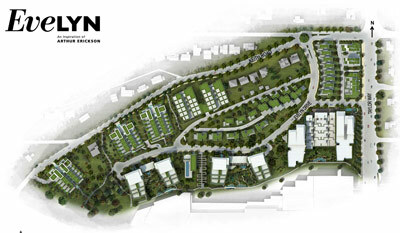 • Evelyn Drive is the product of extensive public consultation at the master planning stage. Evelyn Drive is a community-driven, master-planned neighborhood with high sustainability standards. 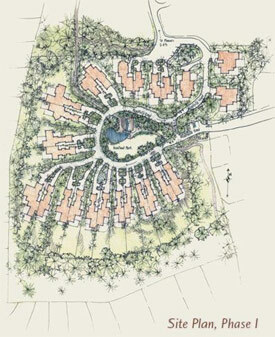 • Millennium has zoning and master plan approval for the Evelyn Drive site. process. Phase 2 is 85% complete. • Phase 1 of the Building Permit drawings are 80% complete. • Millennium’s site serving plan has been approved. • Site preparation is complete at Evelyn Drive – this included the demolition of existing homes, clearing and grading for road access. • Subdivision approval is necessary for any construction to begin, and it is dependent upon the transfer of 9th Street by Province to the District of West Vancouver. The Province has now agreed to the transfer, opening the way for final approval. Evelyn West Vancouver Luxury Homes now selling! The much anticipated launch of the West Vancouver Park Royal real estate project by Millennium Development Corporation is now here! Previews for these spectacular new West Vancouver condos and townhomes just north of Park Royal shopping centre will be opening at the Evelyn Presentation Centre this weekend. Check out the Evelyn offerings, floor plans, amenities and much more. From their email blast: Thank you for your interest in the luxury Evelyn West Vancouver condos for sale. As the vision of Evelyn Park Royal residences becomes a reality, we are excited to be building fine architecture, which is the inspiration of the late Arthur Erickson, one of the most respected and award winning architects of the 21st century. The presales West Vancouver Evelyn condos is on a gently sloped garden property of approximately 20 acres, ideally situated above Park Royal Village in the most sought after West Vancouver real estate market. The luxury West Van homes and condominiums are close to Ambleside and Stanley Park, with beautiful views overlooking the waterfront, Lions Gate Bridge and the downtown skyline. Public transit is steps from the Evelyn West Vancouver condos for sale with convenient automobile, bicycle and pedestrian access to downtown Vancouver via Lion's Gate Bridge. As an West Vancouver Evelyn Condominium VIP registrant we are pleased to inform you that our initial phase will be available for first previews in the weeks to come. Our Evelyn West Vancouver condo sales team will be in contact with you very soon to set up a private viewing of our fabulous new Evelyn Park Royal presentation centre located on site at Taylor Way and Keith Road. In the mean time, please click here to verify your interest in Evelyn real estate development and that you wish to be contacted. This will ensure you are placed at the top of our priority list for presales purchases at the luxury West Vancouver condominiums for sale. As a FIRST sneak peek for you - go here to view a Evelyn Condo master planned site plan illustrating the first phase of this amazing community at Evelyn West Vancouver. Should you have any questions, please feel free to contact us at 604.921.1010. We look forward to speaking with you soon. Yours truly, Bob Rennie & The Evelyn Sales Team. Previewing for these luxury West Vancouver condos for sale starts Fall 2009 at 710 Keith Road, West Vancouver | t: 604.921.1010 | w: www.evelynliving.com. For more info about the exciting new Evelyn West Vancouver condo development inspired by Arthur Erickson, click here. rel="nofollow">For the preliminary West Van Evelyn sitemap, click here. Evelyn West Vancouver condos for sale is a master planned community at Sentinel Hill above Park Royal Village in one of the most sought after addresses on the North Shore. A joint collaboration between the late Arthur Erickson and Nick Milkovich Architects in addition to Walter Francl Architecture have combined forces to produce one of the most exciting new West Vancouver condo developments on the North Shore real estate market. The builder for the Evelyn West Vancouver condominiums and townhomes is by the Millennium Development Group. The building site for the new West Vancouver homes for sale at Evelyn Living will be situated on a gently sloped twenty acre garden property that is located at the Village of Park Royal that overlooks the amazing waterfront, Lion’s Gate Bridge, downtown Vancouver and Sanely Park. In addition, the new West Vancouver homes at Evelyn Condos and Townhomes will be part of a truly sustainable North Shore real estate development following all LEED guideines for building construction. The initial offering for these new Evelyn West Vancouver homes for sale will include only 4 Evelyn townhomes for sale (that are roughly one thousand seven hundred and seventy square feet) in addition to 109 Evelyn homes (condo style) that range from seven hundred and twenty to two thousand and fifty eight square feet in size. The new presale Evelyn West Vancouver homes will have layouts to cater to all lifestyles and requirements and range in configuration from one bedroom Evelyn condo floor plans to the large family sized three bedroom Evelyn West Vancouver condominiums plus family room residences for sale. All of the West Vancouver Evelyn homes for sale will come with the National Home Warranty. Combining earth, water, sky and spirit, this new North Shore real estate development will certainly become the most prestigious project in the history of West Vancouver property market. The prestigious new enclave on West Vancouver’s most sought after address provides true West Coast modern living spaces and a location that is unparalleled. The initial offering for the presale West Vancouver Evelyn homes for sale will include those on the western side of the twenty acre parcel of land at Sentinel Hill Park Royal North. There will be the condominium style residential buildings at Evelyn Cliffside One as well as Cliffside Two for sale, that will feature residences between one and three bedroom floor plans. Also available will be the West Vancouver Evelyn homes for sale at At Forest’s Edge One and Two. Lastly, the initial offering at the Evelyn West Vancouver homes for sale will include the prestigious two and three bedroom Evelyn townhomes. Finally released after more than a year of pre-marketing launches, the luxury West Vancouver condo homes for sale at Evelyn Park Royal reale state dvelopment will feature not only spacious, but open concept functional floor plans that will include impressive floor to ceiling windows, oversized tiled patios and outdoor living spaces that will maximize your views of downtown Vancouver, the water and mountains as well as quality craftsmanship and detailing throughout the residences. These luxury West Vancouver Evelyn homes for sale will also include three different professionally designed and selected colour palettes that include the Dundarave (dark palette), Caulfield (medium palette) and Ambleside (light palette) so that homebuyers can customize their home effectively. The spa inspired bathrooms and master ensuites here at the new luxury West Vancouver homes for sale at Park Royal Evelyn condominiums and townhomes will be a personal sanctuary where homeowners can relax at any time. With Eggersmann cabinetry with wood grain finishes as well as stylish under counter basins and modern Dornbracht MEM faucets, the highest end quality fixtures and finishes have been added into these spectacular luxury West Vancouver homes for sale at Evelyn Living in Park Royal North. In addition, there are dual flush toilets, contemporary main tub with deck mounted Dornbracht MEM faucetin polished chrome, Statesman shower head, rain head shower heads, hand shower bar, quality oversized porcelain tiled flooring (in powder/second baths) and elegant limestone flooring and walls in the ensuite. The gourmet kitchens here at the Park Royal Evelyn luxury West Vancouver homes for sale will have high quality appliances (as explained below) in addition high end fittings, hardware, stainless steel sink, mixer sprout and pull out kitchen faucet. As far as the stainless steel appliance package is considered, gourmet chefs can take note that the new Park Royal Evelyn condominiums/townhomes at the luxury West Vancouver homes for sale will have Bosch 4 burner gas cooktop (30”), Bosch single oven (27”), Built in hood fan (36”), Panasonic microwave (24”), Bosch Incognito dishwasher (24”) and a SubZero built in fridge (27”). Some of the townhome floor plans and larger Evelyn condo residences for sale will also have even bigger appliances that include a Bosch five burner gas cooktop (36”), Bosch single oven (27”), Bosch speed oven (24”), Built in hoodfan (36”), Panasonic microwave (24”) and Bosch Incognito dishwasher (24”). Some of the additional appliances and features of the larger kitchens here at the presale Evelyn West Vancouver homes for sale included Bosch built in coffee system (24”), SubZero built in fridge (36”) and SubZero wine cooler (24”). An optional appliance for these new luxury West Vancouver Evelyn condominiums and townhomes will include efficient and organized stackable washer and dryers. There are three distinct building types here at the new West Vancouver Evelyn real estate development that includes: Evelyn Estates Towers, Evelyn Garden Townhomes and the luxury Evelyn Private Homes. Each of these residential building types are located throughout the property along the terraces and gentle slope that make up the grounds. There are a few sample West Vancouver Evelyn floor plans released by the developer already. The first is that of the Evelyn Estates Towers condominiums floor plans that includes Evelyn Plan B1 that is a two bedroom plus den unit between 1107 to 1135 square feet with a 192 square foot terrace and 162 sqft of professional landscaping around the unit. Plan C1 at the Estates Towers Evelyn Floor Plan includes a 2 bed plus den unit slightly larger around 1178 to 1195 square feet with an expansive terrace deck between 530 and 695 sqft in size with 375sqft of landscaping. The West Vancouver Evelyn floor Plan C2 is 1108 sf with a large terrace deck as well. The Evelyn Townhome Plan TH is a 2 bd/den unit at 1697 to 1742 sq ft. Some of the Evelyn Garden Townhomes floor plans includes A2 which is 2 bedroom and family room at 1500 square feet with a terrace of six hundred and seventy square feet and 990 landscaping. Plan B at the Garden Townhomes Evelyn floorplans are 1830 square feet in size but also includes a one thousand to two thousand square foot private garden. Last but not least are the Garden Floorplan C which is 1170 sf. All of these new West Vancouver Evelyn floor plans are available as PDF downloads online. As part of the commitment to create a sustainable and truly livable long term community, Millennium Development Corporation will also be designing and adding Evelyn amenities into the future phases of the construction of the Evelyn West Vancouver homes for sale neighbourhood. Some of these future phase amenities at Evelyn Living will include a complete selection of urban amenities, personal services and shopping that will be adjacent to the Evelyn West Vancouver Park Royal site. In addition, residents at the Evelyn West Van homes for sale will also be within a quick drive to all the waterside parks, promenades, green spaces, beaches and community services and amenities too. The Millennium Development Corporation will also incorporate ample secured and convenient residential as well as visitor parking on site for both cars and bikes as part of the master plan. The landscaping at the new Park Royal Evelyn luxury West Vancouver homes for sale development will have both street trees, tree lined streets that are pedestrian friendly, heritage style look and fee, tranquil greenspaces and gardens, water features, inviting walk ways, walking trails, pathways and community linkages to create a more established neighbourhood feel to Evelyn West Vancouver homes. The future phase of development here at the new West Vancouver homes for sale at Evelyn Park Royal condominiums and townhomes will also featured residential amenity spaces that include a private Clubhouse that will feature an impressive outdoor lap pool and a soothing hot tub. In addition, residents at the presale West Vancouver condos at Evelyn homes will enjoy a fully equipped state of the art fitness centre, a relaxing lounge space and a media video room. All of these will be developed during the second and third phases of the project. An inspiration of Arthur Erickson - A prestigious new enclave on West vancouver's natural rise. THE EARLY BIRD GETS TO SEE IT FIRST - Thank you for your interest in Evelyn, Millennium's latest community in beautiful West Vancouver real estate development. Inspired by Canada's Arthur Erickson, Evelyn West vancouver condos and townhomes celebrates nature in a village locale - a prestigious new West Vancouver address and elegant living environment, perfected by green design and the quintessential West Van lifestyle. We are pleased to invite you to our West Vancouver Evelyn Priority Preview of the Presentation Centre this weekend, starting Saturday at noon. Our Evelyn Presentation Centre for these West Vancouver condos and townhomes is located at 710 Keith Road (at Taylor Way) and will be open daily 12-5PM starting this Saturday (closed Fridays). For more information about Evelyn West Van inspired by Arthur Erickson, please call 604.921.1010 or visit us online at evelynliving.com. Hope to see you soon! 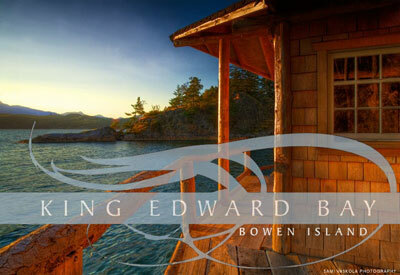 Huge Price Reductions on Bowen Island King Edward Bay Lots and Home Sites - Build Your Dream Home at Discounted Prices on Waterfront Home Sites! Pricing significantly below appraised value, acquisition of these Bowen Island waterfront lots will provide instant equity to the ready home buyer here at King Edward Bay Bowen Island real estate opportunity. The photograph in the advertorial looks out over King Edward Bay Bowen Island itself. It was taken from the boat house on Lot 17, an impossible to find amenity sited on one of the last available Bowen Island waterfront lots for sale in this real estate development. King Edward Bay Bowen Island is a remarkable collection of fully serviced waterfront and water view lots on Bowen Island, ideally situated to enjoy breathtaking sunsets on the western side of the island. As one drives through the carefully protected forest setting to admire new hosues taking shape it is clear there is something special about this new Bowen Island waterfront real estate neighbourhood: it is only a 25 minute ferry ride away from Vancouver. Far away from it all, yet so near. Developer David Sorensen states: “We have chosen this moment to make our aggressive pricing available to the discerning buyer. A rare waterfront opportunity and not one to be missed.” For more details about the remaining Bowen Island waterfront lots for sale at King Edward Bay real estate development, please call 604.947.2891 or visit www.kingedwardbay.com. If you are looking for the perfect locale to build your dream home right here in the city, Bowen Island home sites at King Edward Bay real estate development is where you should be looking. Situated just a short ferry ride away from West Vancouver via Horseshoe Bay at the entrance of Howe Sound, a small enclave of Bowen Island home sites and lots for sale are now being reduced in price so that you can realize your waterfront home dream. Welcome to King Edward Bay waterfront lots for sale here on Bowen Island real estate market. An exceptional legacy property awaits you, whether it is for pure recreational purposes or generational living. These fully serviced King Edward Bay lots for sale are located on the prime south west facing oceanfront Bowen Island real estate community, and with over forty eight acres of prime waterfront property in the neighbourhood, these home sites are large and private. Beautifully nestled into old growth forests and tonnes of green spaces, the development here at the Bowen Island lots for sale at King Edward Bay waterfront property has minimal impact on the surrounding natural environment, so that you and your loved ones can continue to experience true West Coast living. Where else can you find such a pristine location in Greater Vancouver real estate market? Brought to you by the principal and visionary, David Sorensen, the Bowen Island King Edward Bay lots for sale have now been dramatically reduced in price, allowing you to purchase a dream waterfront Bowen Island lot for sale in the most desirable King Edward Bay home site community. The building guidelines must be adhered to in order to preserve the community, natural environment and your investment. Designers, architects, construction staff and design reviews can be conducted through the Sorensen Design Studio professional team here at King Edward Bay on Bowen Island waterfront lots for sale. The first homes here at King Edward Bay homesites are expected to be complete later in 2009 into 2010. However, if you are still looking to purchase a new Bowen Island lot for sale, King Edward Bay community definitely has some enticing offers right now for you to build your dream home on. The King Edward Bay Sales Office is located at 1760 Frances Walk, Bowen Island (on site now) and is open weekends by calling 604.842.5865 or Monday through Friday by calling 604.947.2891. As of September 2009, there has been a huge price reduction on the remaining unsold home sites and Bowen Island Lots for sale here at King Edward Bay master planned waterfront community. The first is Lot 01 that is has been reduced from $395,000 to $276,500 and features 1.0 acres of land (forest lots). Forest Meadow Lots 04 and 05 are priced at $297,500 (from $425,000) and $311,500 from $445,000 respectively and both are over 1.0 acres in size, a huge area to build your dream Bowen Island waterfront home. The 1.1 acre Lot 11 here at King Edward Bay on Bowen Island is featured at $875,000, being reduced from $1,250,000 and features 65 ft of waterfront frontage. The prime Bowen Island waterfront lots have also been reduced, with King Edward Bay Lot 15 reduction from $1,425,000 to $997,500 (with 63 ft frontage, 0.7 acres total), Lot 16 with same pricing (92 ft waterfront frontage and 0.8 acres total), Lot 17 now at $1,155,000 (134 ft frontage with boathouse/dock and 0.6 total acres) as well as King Edward Bay Lot 18 at $1,046,500 with 160 ft of waterfront frontage and 0.6 acres lot). The impressively large King Edward Bay Bowen Island Lot 20 for sale is now priced from $1,190,000 down to $833,000 and features 1.3 acres of land and 108 ft frontage, making this a prime waterfront home site for a dream home. Next to it is Lot 21 at $945,000 featuring 0.8 acres and 117 feet of waterfront frontage. Last but not least here at the Bowen Island lots for sale at King Edward Bay home sites community is Waterfront Lot 27 at $962,500 (from $1,375,000) with 0.6 acres, 164 feet of frontage as well as a private beach. For more information about the price reductions on the King Edward Bay lots for sale on Bowen Island real estate market, please visit their online website for the latest availability and pricing at www.kingedwardbay.com. Gallleries on the Bay West Vancouver Condos – Major Price Reductions! At Galleries on the Bay, take advantage of the major price reductions now on selected units. Galleries on the Bay is a new West Vancouver condo development with the utmost in luxury and convenience within the beautiful Horseshoe Bay community. Water and mountain views from all rooms, plus cathedral ceilings and cove moldings give you a very spacious feeling in every room. You will have year round comfort with air conditioning, in floor radiant heating and a fireplace here at the new West Vancouver condos for sale at the Horseshoe Bay Galleries on the Bay development. Top quality finishes include engineered hardwood flooring (maple), designer series Toto bathroom fixtures, and LG steam washer and dryer. Entertaining is a pleasure in the gourmet kitchen with Professional Serices Viking appliances complete with a large wine cooler and reverse osmosis water purifier here at the presale West Vancouver condos at the Galleries on the Bay real estate development. Also, enjoy a huge outdoor terrace with natural gas outlet for those summer barbeques or winter heat lamps. The quaint village of Horseshoe Bay is now home to the new West Vancouver Galleries on the Bay development and features restaurants, boating, golf, skiing at your doorstep. Yet, the express bus puts you in downtown Vancouver in mere minutes. Westcoast lifestyle at its best is now available here at the Galleries on the Bay West Vancouver condos for sale. The major price reductions includes one bedroom Horseshow Bay condos from $425,000 and two bedroom suites from $899,000. The Galleries on the Bay West Vancouver condo presentation centre is now open weekends from 12-4pm. Life is about experiencing each moment with an adventure of senses. The major price reductions on these spectacular and luxury West Vancouver homes for sale are now here. 1 and 2 bedroom apartments from $425k which includes GST! Located at Royal aVenue and Bay Street in Horseshoe Bay West Vancouver real estate district, visit galleriesonthebay.com for any additional resources and information. Conveniently located at 1891 Marine Drive and half way between the West Vancouver real estate villages of Ambleside and Dundarave, Parkview Place pre-construction West Vancouver condo townhomes is an exclusive collection of just 10 garden homes all very private and ranging from 788 to 1396 square feet. Features at the Parkview Place West Vancouver condos include stone counters, SubZero and Miele appliances, in-floor radiant heat in ensuites, and central vacuum. Located just steps from restaurants, shops, services and the West Van seawall, this is a rare real estate opportunity to purchase a brand new concrete townhome in one of the Lower Mainland’s most prestigious neighbourhoods. Prices for the pre-construction West Vancouver townhomes at Parkview Place condominium residences are expected to be announced this fall. For more information and to be on the priority list for all future updates, please visit www.liveparkview.com. Conveniently located between both Ambleside and Dundarave and just a couple blocks from the beautiful seawall and water, the West Vancouver Parkview Place condominium style townhomes will be close to a great array of local amenities that this wonderful community is so well known for. Featuring only 10 new pre-construction West Vancouver townhomes at 1891 Marine Drive, West Van, the Parkview Place pre-sales condos will be built by Linda Burger real estate developers who have designed the most spectacular and detail oriented homes in all of West Vancouver. With superior craftsmanship, these private, garden residences at Parkview Place will be close to everything you need to see and do. The ten distinctive residences at the pre-construction new West Vancouver condo townhomes include Residence 1 (3 bed plus den) at 1,396 sq ft, Residences 2 - 4 (2 bedroom suites at 1,019, 1,021 and 1,026 square feet respectively), Residence 5 (2 br + den + solarium) at 1325 sqft, Residence 6 – 8 (2 br plus rooftop deck (1,166, 1,170 and 1,179 sq footage), Residence 9 (1 bedroom plus den) 1,061 sq ft and Residence 10 which is the smallest at 788 square feet. You can visit http://www.liveparkview.com/residences.html for all teh detailed floor plans at Parkview Place condominiums in West Vancouver real estate market. A perfect 10, combining luxury, location and lifestyle at the pre-sale West Vancouver condos at Parkview Place. With only ten distinctive residences, the Parkview Place West Van condos are now previewing by Lynda and Ray at 604.644.4623 or visit liveparkview.com. From their latest email push: Just a quick update on what is happening with Parkview Place. There has been a great response to our initial email and we are working as fast as we can to get the pricing of the units out to those who have inquired. Unfortunately we cannot disclose any pre-construction West Vancouver condo prices at Parkview Place condominiums until the lawyers have fully completed the disclosure statement. They have told us that this should be done by Monday and we will respond to those you have requested pricing. To the many of you who have asked when can you actually purchase a unit at the pre-construction West Vancouver Parkview Place condos, a soon as we have the disclosure statement we are in the position to write contracts. The Ten Distinct Residences of Parkview Place West Vancouver condo apartments are now being offered and occupancy is commencing Fall of 2009. Located at 1891 Marine Drive, West Vancouver real estate market, the luxury residences at Parkview Place are built by Linda Burger and Associates who have an outstanding reputation for quality and client satisfaction. Assuring each condominium home purchaser at the Parkview Place West Vancouver property development with impeccable design and quality, the boutique homes for sale are located in the heart of West Van, close to everything. You will agree that these beautiful Parkview Place residences are a ‘perfect 10’. Presented by Lynda and Ray at 604.644.4623 and designed by Karl Gustavson of Design Marque, please visit proc.ca for addition information about this West Vancouver condo development now launching. Some of the impressive features include stunning architecture by Karl Gustavson, floor space with natural lighting, concrete construction, aluminum bronzed windows, landscaped gardens with a great water feature and secure underground parking for all Parkview Place West Vancouver condo suites. The interiors of the pre-construction townhomes at Parkview Place West Van will also provide front loading Bosch washer and dryer, architectural detailing including mouldings and baseboards, screen-weave Solar Blinds, solid core doors, gas fireplaces, wool blended carpets, custom hardwood flooring and floor to ceiling windows. The gourmet kitchens at the West Van Parkview Place townhomes will have custom built wood cabinets, stone counters, porcelain backsplashes, under cabinet lighting throughout, recessed lighing, very high end appliance package, and extra deep double sinks. The ensuites bathrooms will have imported porcelain floors, one piece dual flush Kohler toilets, custom built wood cabinets, stone counters, frameless glass shower, soaker bathrub with Grohe fixtures, wdesigner selected wall sconces and recessed lighting and in floor radiant heating. The security and technology at these new West Vancouver condo homes at Parkview Place will have the 2/5/10 year National Home Warranty in addition to storage areas, monitored fire sprinkler systems, pre-wiring for internet, cable and phone lines, personally encoded entry device permits access to building lobby and underground parking, secure parking, enterphone, central vacuum system and security system. The West Vancouver real estate developer for the Parkview Place townhomes will be Linda Burger and Associates of West Van. Dear Parkview Place Enthusiasts, Thank you for registering for our exclusive mailing list for updates about the West Vancouver Parkview Place luxury condo homes and distinctive residences along Marine Drive on the North Shore. We will be updating you on a regular basis as to our progress with this pre-construction West Vancouver real estate condo development. We are roofed and well on scheduled for our summer of 2009 opening. If you haven’t visit our website recently, we encourage you to do so as we now have detailed Parkview Place condo residence floor plans for each of the ten luxury pre-sale West Vancouver homes. We hope you have a wonderful summer and look forward to meeting and serving you in person soon at the presales West Vancouver Parkview Place residence condominium homes on Marine Drive North Shore. Linda Burger – Parkview Place. www.liveparkview.com. A similar luxury townhouse development is marketing for presale at The West of Central Lonsdale townhomes in North Vancouver real estate market. A community snapshot of Horeshoe Bay real estate in West Vancouver. Like a world unto itself, Horseshoe Bay has an almost mystical charm most people find impossible to resist. Quaint boutiques, funky eateries, and “you never know what treasure you’ll find” galleries are the order of the day here. And though the waterfront real estate promenade at Horseshoe Bay isn’t as long as some, it is an undeniably beautiful one. Purchasing a new home in Horseshoe Bay rela estate is challenging, as supply is limited and most people who live here, simply don’t move homes. Surprisingly, however, at press time, all six of the houses and one duplex listed cam e inwith a price tage of less than $1 million making this a good value if you can get one. But the big news in the Horsehoe Bay real estate community is Galleries on the Bay, a $17 million collection of 16 condominium homes and the first of its kind ever in Horseshoe Bay. Previously, only a small set of old fashioned apartments above the grocer and two suites built above retail in 1986 comprised the entire strata home stock. This is the Horseshoe Bay Village’s only true multi-family real estate development and with its ground floor reteail, the first new commercial development here in three decades. As West Vancouver’s Mayor Pamela Groldsmith-Jones cut the ribbon at Galleries on the Bay official opening ceremony June 13, the structure was already being hailed as a landmark building that will change the face of real estate in Horseshoe Bay. Conspicuously absent was any dissent – the project was greeted by unanimous enthusiasm, thanks, in large part, to an architectural style that combines the sweeping West Coast look with a sophisticated, contemporary sleekness and warm earthtones. Inside, each Horseshoe Bay Galleries on the Bay condo home is a unique with a character an personality of its own. Floor plans range from 707 to 1,505 square feet and are meticulously placed to maximize the spectacular ocean and mountain views from each of the many private terraces and solariums. Finishing details at the Galleries on the Bay at Horseshoe Bay are extravagant yet maintain an elegance that’s clearly turning heads. “When you find a site like this, you have to be responsibilitiy to create something special,” said real estate developer Ali Amedi from Primex Developments. “Visitors from abroad as well as local people will be watching Galleries ont eh Bay. It was important for us to maintain an attention to detail that would be outstanding.” Pricing at the Galleries on the Bay in the Horseshoe Bay real estate market are attractive and competitive. One bedrooms from $558,000, two bedrooms with unobstructed ocean views from $1.1 million, plus a few select live/work suites from $498,000 to $640,000. For more information, please visit www.galleriesonthebay.com. Written by S. Boyce for 24 Hours. An elegantly designed, 16 home development at 6688 Royal Avenue in the heart of Horseshoe Bay real estate, Galleries on the Bay West Vancouver condos offers a rare property opportunity of home ownership in one of Greater Vancouver’s most desired seaside settings. Floor plans at these new pre-construction West Vancouver condos range from 707 to 1,505 square feet and no two are the same. Available in one, two and three bedroom configurations, each home at Galleries on the Bay apartments boasts spectacular views, terraces, and solariums, radiant in floor heating, air conditioning, and front loading steam washer and dryer. Gourmet kitchens at these new West Vancouver Galleries on the Bay condos are equipped with Professional Viking stainless steel appliances including gas stoves with convection oven French doors, refridgerators with bottom mount freezers, wine fridges, and water purifiers. Four ground floor live/work spaces rub sholders with Starbucks and a First Nations Art Gallery, the first commercial addition to the Horseshoe Bay village in 30 years. The Galleries on the Bay’s presentation centre and display homes are open Tuesday to Sunday from 1:00 to 5:00 pm. For more information, visit www.galleriesonthebay.com. A grand apartment reminiscent of exclusive Manhattan grandeur, this Watermark Amica West Vancouver home offers you expansive living with extraordinary finishings and classic but modern styling. A perfect home at the Amica Watermark West Vancouver real estate property for entertaining with an open living plan, generous windows and over height ceilings. Nestled into the landscape, Watermark properties capitalizes on it’s natural environment providing picturesque views and privacy. AS part of a larger community plan, the Clyde Avenue property blends seamlessly into its surroundings in West Vancouver. 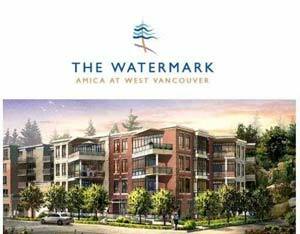 As part of your homes livability you have exclusive access to Amica’s Wellness and Vitality West Vancouver services located in the neighbouring real estate property development. From fine dining to the Amica Club facilities, no other condominium can offer the level of service that The Watermark West Vancouver does. Contact Grant Connell for more information about this fabulous offer at the Amica West Vancouver Watermark condos at 604.250.5183 or visit www.grantconnell.com. Designed for the most discerning tastes, every one of these spacious West Vancouver townhomes enjoys a spectacular view of Howe Sound. Inside Seascapes townhomes, natural materials such as granite, ledgestone, hardwood and more, reflect the majestic West Coast setting of this prime West Vancouver real estate deveolopment perched up on a hilltop. You’ll understand why our windows have frames. Move in now to West Vancouver Seascapes townhomes as GST is included for the next five sales. Seascapes West Vancouver townhomes with views start from $899,900 to $999,900 and range from 2,250 to 2,350 square feet with a 300 square foot additional storage space. Final release of remaining Seascapes West Vancouver townhome units is on now so visit the Seascapes show home that is open 12 to 5pm on weekends or by appointment at 8670 Seascapes Drive in West Vancouver. Call Arthur at 604.727.5478 or visit www.seascapestownhomes.ca for additional information about this last Seascapes townhomes opportunity for purchase. More about the West Vancouver Seascapes Townhomes is available here. The best way to see Howe Sound? Just open your blinds says the new advertisement for the pre-construction West Vancouver Seascapes residences. Each presale home at Seascapes West Van real estate offers a breathtaking view of Howe Sound. See the best of the West Coast comfort of your bedroom, living room and kitchen. Just a quick five minutes north of West Vancouver’s prestigious Caufield Village, Seascapes real estate development overlooks the deep, blue Pacific and is enveloped by mature coniferous trees and green spaces. Inside these pre-construction Seascapes Homes, home buyers will find spacious two thousand, three hundred and fifty square foot family or couple sized residences with bright open spaces and floor plans. In addition, the West Vancouver Seascapes pre-construction condo homes will have finishes of natural materials that have been incoporated in every room including such luxurious finishes as hardwood, granite, ledgestone and many other textural and beautiful detailing from the surrounding environment. Right now, the best part is that the presale Homes at Seascape West Vancouver start from just $829,900 and this is definitely an uncommon value in West Van property market that you’ll never find again. So don’t miss out on this great pre-construction new West Vancouver property development at Seascapes Community where you can now purchase a presale West Van view townhome between the pre-construction pricing of $829,900 and $979,900. The Seascapes Townhomes Show Home is now open noon to five on weekends or you can also book a private appointment by calling Arthur at 604.727.5478. The project marketing for the Seascapes Townhomes is by The agency Real Estate Marketing. You can also visit their show home for the pre-sales West Vancouver Seascapes Townhomes which is located on site in West Vancouver on Seascapes Drive. A place where nature is revered. A polace where homes are crafted. A place where life is balanced. The Ridge at Evergreen on Bowen Island real estate involves a conscious decision to slow down, to simplify, to revel in nature and live lightly within it. The Ridge at Evergreen Bowen Island property. Meander through the rich coastal forest and emerge at The Ridge at Evergreen where time stands still. This is a once in a lifetime Bowen Island real estate opportunity to create your Ridge at Evergreen Bowen home on one of four available lots. The Ridge at Evergreen lots on Bowen Island real estate start from just $525,000. Contact information. Call today to preview The ridge at Evergreen lots and home sites available by Penny at Sutton Centre Realty, Bowen Island at 435 Bowen Island Trunk Road. Call 604.803.4400 or email penny@bccoastalliving.com for additional details. The marketing web site for this Bowen Island property development at Evergreen Homes is located online at www.evergreenbowen.com. A project, a place, a sanctuary, a getaway, a resort, a quiet relaxing holiday. This is what Bowen Island BC is all about. With many great recreational opportunities and a very close location to West Vancouver, Bowen Island real estate has boomed in recent times due to its picturesque locales, sites, people and close proximity to the mainland via the BC Ferries service. If you are looking for a premier BC waterfront home or site lot to build your dream home, the Ridge at Evergreen Bowen Island waterfront real estate will be your ideal homesite. Get close to nature yet be just a ferry ride away from prestigious West Vancouver. At evergreen on Bowen Island real estate, this will be a quiet neighbourhood of smaller homes where sustainable living and building practises will be met, where forests will be left untouched and modern technologies will connect you to the world outside. Family and nature, waterfront Bowen Island real estate and impressive views, these are the pre-construction Evergreen Homes on Bowen Island. Views of the ocean and the adjacent beautiful BC islands will be seen from a release of only four pre-sales Evergreen Lots on Bowen Island, soon to be launched in 2008. A natural environment that will see the creation of a total of only twenty three home sites along this coastal bluff on Bowen Island real estate, the Evergreen family home lots are a sanctuary for some of the most amazing native bird species, other evergreens and plants. This family of home sites on Bowen Island will be a unique property development where you can only access it through a meandering single lane former logging trail, which will ensure your privacy and a quiet neighbourhood. The Ridge at Evergreen Bowen Island real estate will be the first phase of the Evergreen home sites and will launch a total of 15 homesites that range between 1 and 1.2 acres in size. The Evergreen Ridge home sites marketing has just launched. The homesites on Bowen Island property will face the Paisley and Keats Islands as well as Bowen Bay Beach, Arbutus Point and of course the water. The presale Ridge home sites at Evergreen will also be nestled within 40 acres of natural environment which will be protected aggressively to minimize the environmental impact of this development. The vision for the Ridge at Evergreen homesites was envisioned back in 2004. With timeless craftsmanship and west coast architecture, the family style homes visioned for the Evergreen lots are going to have minimal impact on the environment. Evergree Simply Bowen will have a lasting value for generations to come. 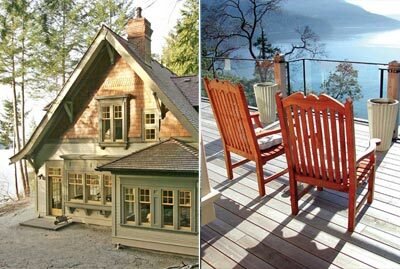 The Bowen Island lifestyle is simply slower, more relaxed and definitely rejuvenating. The Simply Bowen Island Evergreen Ridge homesites will provide a sanctuary for homebuyers to esacpe and getaway from the big city frustrations, noise and traffic. The benefits of the smaller home restrictions on the Bowen Island real estate homesites at Evergreen Ridge will ensure that everyone has a chance to enjoy the natural surroundings. With leading edge sustainable building guidelines, homes at the Ridge at Evergreen on Bowen will offer lower utility costs, improved air quality and less reliance on fossil fuels through time. For more information about the Evergreen Home Sites on Bowen Island real estate, please visit their web site at www.evergreenbowen.com. The property development team consists of Malkin Creek Holdings developer, Estudio NORTE | SUR for sustainable development consultation, Studio 947 for graphic design and marketing, E.A.B. Beaird Consulting through community planning in addition to Claudia Schaefer photography and Cosmic Idea web design. For sales information about the pre-construction Bowen Island home sites at the Ridge at Evergreen Phase 1 release, please contact Penny of Sutton Centre Realty at penny@bccoastalliving.com, or by phone at 604.803.4400 or 604.947.2725. 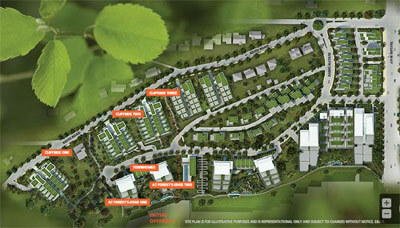 The location of the home sites for the Evergreen Bowen property is located at 435 Bowen Island Trunk Road. Note: The foregoing is published for informational purposes only and is not intended to constitute an offer to sell any of the proposed lots or to solicit offers to purchase the proposed lots. The Developer will only market the proposed lots once a Disclosure Statement has been filed with the Superintendent of Real Estate pursuant to the Real Estate Development Marketing Act of British Columbia. For a Bowen Island community map, please refer to this web page at http://www.evergreenbowen.com/community.html. According to the July 2008 newspaper, The North Shore News and written by Manisha K, Plans for the rejuvenation of West Vancouver’s Ambleside town centre were met with a mixture of enthusiasm and anxiety at Monday night’s public hearing. Residents of Ambleside West Vancouver real estate packed the municipal hall to express their opinions on new official community plan and zoning bylaws for Ambleside district between 13th Street and 19th Street along Marine Drive. While most applauded the West Vancouver district’s effort to breathe life into Ambleside, by creating a more concentrated commercial core, concerns were raised on issues of height, density and parking. Rezoning Ambleside in West Vancouver real estate of the area into mixed residential and retail spaces will allow for mainly two to three storey buildings, with the possibility of four storeys on sites that meet width and depth requirements. However three “special sites” on the 1300-, 1400- and 1600- blocks of Marine Drive in Ambleside real estate market were left out of the new zoning regulations, alarming some residents who feel larger West Vancouver real estate developments should not be open for consideration. Mike MacCallum, of Wedgewood Terrace on the 1700- block of Duches Avenue, said tenants of his Ambleside building feel their view will be ruined if high structures are permitted on the Safeway site. “The two to four storey plan should be across the board,” said MacCallum, adding he was dismayed that the OCP plan allows consideration of a five storey building on the Masonic Hall site. His sentiments were shared by a group of residents from the Memorial Park enclave, along Duchess Avenue, and 18th Street. They were in favour of most the plan, but recommended the district amend zoning regulations on the 1800- block of Marine Drive in Ambleside real estate community to protect single family homes. “The main indoor living areas, decks and gardens will lose the privacy and light that they currently enjoy should present zoning proposals be enacted,” said resident Carl Hunter. District guidelines allow for slightly different zoning for the east and west entrances to Ambleside West Vancouver real estate market – developments there have the potential to be fully residential, in order to centralize businesses. But the 1300- block of Marine Drive West Vancouver has less to lose by tall buildings because there are no single family homes on it, said Hunter. He and fellow neighbours suggested Ambleside buildings should have a maximum of three storeys on Marine and 18th and two storeys along the lane north of it. A great article by Manisha for the North Shore Newspaper in July 2008. Stakeholders eager to see the revitalization of Ambleside real estate district cam eone step closer on Monday when District of West Vancouver Council passed third reading of redevelopment bylaws for the town centre. The approval came after a reconvened public hearing that heard district planning staff responding to concerns raised by residents on July 14th. Staff made no major changes to the official community plan or the corresponding zoning bylaw, but two minor amendments were added to require greater setbacks on new buildings in the West Vancouver Ambleside real estate corridor which were added to require greater setbakcs on new buildings in the 1800 block of Marine Drive and make provisions for the removal of overhead wires along the railway. At the July 14 meeting, residents along the 1800 block of Duchess Avenue expressed concerns that three and four storey buildings on 18th Street and Marine Drive would impact their views, privacy and light. They asked staff to consider restricting the buildings’ height to three storey’s off Marine and two storey’s off the north lane, and increase setbacks from the lane side to be 10 feet at the first storey and 20 feet at the second storey in this Ambleside residential bylaw of West Vancouver real estate. The request for greater setbacks was reasonable, according to the West Vancouver District urban design planner Colette Parsons. But allowance of third and fourth storey’s could actually help residents maintain strategic views, because West Vancouver real estate developers will have the opportunity to create slimmer, more attractive buildings, rather than box-like structures that fill the east-west lot lines, said Parsons. Linda Sherwood, a resident of the West Vancouver Ambleside real estate district, said she’s pleased the district modified zoning bylaws to allow for new setbacks, but asked for a delay in moving forward until her out of town neighbours have a chance to respond. The OCP was also slightly amended, due to a call for under grounding the overhead wires south of Bellevue Avenue, suggested to West Vancouver Real Estate Council on July 14. Such a project would cost around $750,000 according to Parsons. It was added for consideration as part of the community Ambleside real estate benefits package for developents along Bellevue Avenue. Staff also addressed other issues of contention in Ambleside reale state bylaws such as height and three special sites on the 1300, 1400 and 1600 blocks of Marine Drive, which were left out of the zoning bylaw. Four storey’s will only be permitted on sites that meet specific criteria; they must have 120 feet of frontage, an area of at least 14,400 square feet and a grade change of eight feet from the front to the rear, according to the new Ambleside community real estate bylaws of West Vancouver District. Currenly, only one location in ambleside, West Van Florist – fits this description, said Bob Sokol, director of planning, lands and permits. The height flexibility is intended to promote esthetically pleasing structures, added Parsons. The OCP specifies a fourth storey building would only be permitted if the West Vancouver real estate developer in Ambleside property could show it has a superior design. “We’re looking for great buildings in Ambleside. We want beautiful buildings that are going to last,” she said. Clarification with respect to the three special sites was also given. These were left out of the rezoning bylaw of the District of west Vancouver Ambleside community because they are located in strategic areas, at the gateway to the community, near John Lawson Park and between two commercially fronted streets. Each is at least 60,000 square feet in size and all are under limited ownership, according to Parson’s report. Leaving them out of new West Vancouver zoning regulations will allow innovative design ideas to come forward at a later date, with the possibility of securing of public amenities like parking or anew museum. For the moment, what happens on those West Van Ambleside sites will be dictated by their current commercial zoning, said Sokol. During the hearing, a few residents expressed disappointment at what they described as too moderate a plan. Four storey buildings Ambleside should be a minimum, said Rob Harrington, resident and owner of West Van Florist. “It’s time West Vancouverites looked out for their insular enclaves and joined the rest of the world. Urban sprawl is out, sustainability is in,”he said. “any change resulting in down-zoning in unacceptable and will be vehemently opposed.” Elaine Fonseca, president of the Ambleside and Dundarave Ratepayers’ Association, took the opposite view from this West Vancouver Council decision. “I heard the phrase ‘We must change, we must grow.’ Says who?” she asked. “Ambleside is not dead, it’s a little sleepy.. and maybe that’s the way we want it.” West Vancouver real estate Council passed second and third readings of both bylaws by a vote of 4-2 with Couns Bill Soprovich and Vivian Vaughan in opposition, due to reservations about height and parking respectively. West Vancouver Council planning well for sustainable prosperity. As an organization dedicated to promoting, enhancing and facilitating business in our community, the West Vancouver Chamber of Commerce welcomes two recent decisions by Mayor Pamela Goldsmith-Jones and West Vancouver Council that will over time promote considerable new real estate investment, employment and business opportunities for West Vancouver. Ambleside Town Centre Real Estate Strategy: On July 28, 2008, West Vancouver Council amended the Official Community Plan and approved new zoning bylaws that will encourage owners of smaller properties in Ambleside to upgrade and improve the attractiveness of their streetfront and tenant mix. Similarly, new planning real estate guidelines for larger Ambleside properties should trigger several major West Vancouver property redevelopments as new and important focal points for the community. This new plan promises a Vision for Ambleside redevelopment as a fully functioning and sustainable community asset – offering a broader selection of goods and services, pedestrian friendly links between Marine Drive, Clyde and Bellevue, additional foot traffic from new residents and office workers, and a multifaceted precinct that gives West Vancouver visitors a variety of experiences over the course of an afternoon. Rodgers Creek Area Real Estate Development Plan. On the same evening, West Vancouver Council als passed third reading bylaws for long term real estate development of 736 mainly multi-family homes over 215 acres of land above the Upper Levels Highway at Rodgers Creek West Vancouver development. Unlike earlier sections of Upper Lands West Vancouver development ,more than 50 per cent of the area will remain green open space, with real estate development of Rodgers Creek clustered in nodes along a new community mountain pathway. The Chamber of Commerce Board of Directors particularly commends the Rodgers Creek development plan commitment to a future Cypress Village to the west of the first loop on the Cypress Bowl Road. This will make the Upper Lands West Vancouver Rodgers Creek development a much more complete community while offering many new business opportunities for everything from seniors’ housing to professional offices. By Andrew Pottinger, Director of the West Vancouver Chamber of Commerce.